This girl! But the only recreational use of these herbs is culinary. Let me start from the beginning. I don’t have a great track record with keeping plants alive, but I’m working on it. Through a random series of events I recently befriended my across-the-alley neighbor, Danielle, whose second child is only a few months younger than Jack. You can see a glimpse of her house in this photo from when I freshened up my secondhand patio set. One day while Jack and I were over for a playdate I remarked to Danielle that I really admired her herb garden and would love to have one of my own. She offered to come over and take a look at our yard and gave me all kinds of good advice. It was around the time that she was examining blades of grass between her fingers, mumbling to herself about whether it was centipede or bermuda, that I asked, “How do you know all this stuff about gardening?” and she said, “Oh, I actually got certified as a Master Gardener,” like it was no big deal! Three years I’ve lived in this house, and I am only just now realizing I live next to a Master Gardener. And she’s moving in a month! So I’m trying to put all her good advice to use while I still have her around to tell me what I’m doing wrong. I told Danielle that I thought I’d like to put my new herb garden in this awkward corner of our yard. She showed me how to remove the grass with a shovel (she didn’t think my grass would be easily smothered, which explains why I continue to struggle with it in the veggie garden). 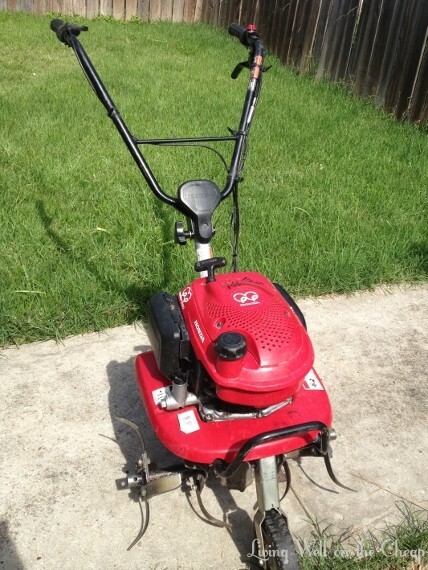 I cleared a 3×9′ strip of grass that very day, then on Memorial Day, with Nick home to hang with Jack while I played in the dirt, I went to Home Depot and rented the smallest tiller they had for $35. The tool rental people didn’t tell me anything about how to operate it, but it was pretty straightforward and actually kind of fun. And it went way faster than I thought it would. I was back to return the tiller to HD within an hour! Bam. Grass and weeds be gone! Some of the bricks are stamped with “St. Joe” or “Salmen,” which means they were actually made in my hometown an hour and a half away and probably original to the house. The backyard feels awfully contemporary in contrast to the actual age of our home so it’s nice to bring some of this brick out where we can actually see and appreciate it. 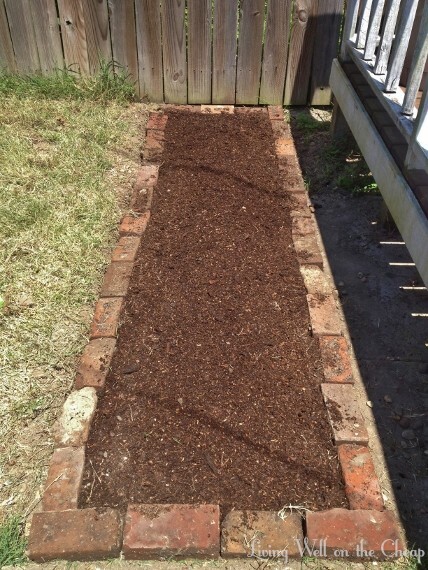 After laying out all my bricks (I tried to get them mostly level and straight but didn’t stress about perfection), I filled the bed with two bags of organic garden soil. I don’t always spring for organic, but in this case it was only a little bit more so I went for it. Then I planted lavender, thyme, rosemary, and basil. They were all $2 starter plants from the hardware store except for the lavender, which I’d started from seed in another pot back when I planted my vegetables. 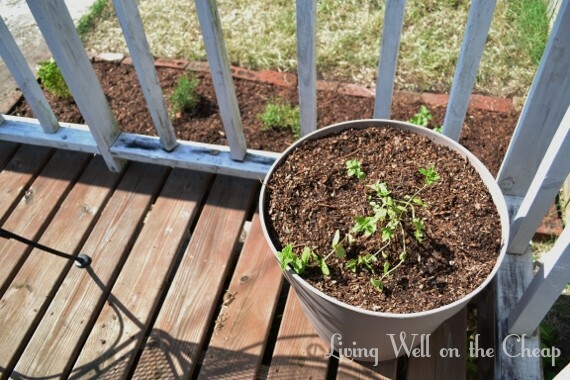 At Danielle’s suggestion I put some peppermint in a big pot on the deck. This way the invasive mint won’t take over the rest of the bed, and I strategically placed it near the table so it’ll release some minty fragrance anytime we brush against it. 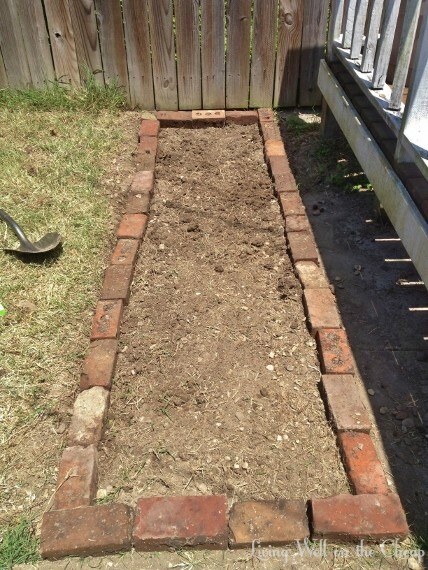 I’ve got a tentative master plan to ditch the pallet compost bin (since I made another one out of a trashcan) and add another brick-edged bed along the left. I can plant veggies in there and abandon the smaller bed that has grass growing beneath it. I could place a small shed between them to finally have a place to put my garden tools, and maybe put in a set of steps off this side of the deck to make it easy for us to access this little part of the yard. The weird concrete walkway creates a natural division for this area to be a dedicated garden space. The only thing holding me back is that sheds are almost always way bigger than we need/want and surprisingly expensive. I wish we were handy enough to build one! I will most definitely be moving my veggie garden for next year’s growing season, though. I love the idea of two brick-edged beds mirroring one another in a little garden nook separate from the rest of the yard. Speaking of my veggie garden, things are coming along swimmingly. I’ve got a couple of plump, green tomatoes I’m waiting for the perfect moment to pluck before the bugs get them and I’ve been harvesting plenty of crisp sugar snap peas (straight from the vine into my mouth. They don’t even make it inside). My cucumber plants are looking extremely promising and I hope to have some okra soon as well. I’ve found vegetables much easier to grow than shrubs or flowering plants, so let’s hope my luck extends to the herbs. It’ll be easy to remember to weed and water them when I find the bed so charming! I’ve looked on craigslist but around here they’re all HUGE! I don’t have room for a 12×12 or even 6×8. I love the old bricks. What a nice touch. I pick up interesting rocks from any place that I can especially from trips and vacations. I like the look in the garden whether used as edges or just in between things. Your garden season is, way ahead of ours, of course, but I am beginning to think that I have to write this year off pretty much. Trying to do things while on crutches and with a foot I am not supposed to put any weight on has put a damper on things. I have pulled weeds, cleared some things and enjoyed some of my perennials, but have given up on major projects. Oh bummer! I didn’t realize you’d hurt your foot so badly! Wow! What a difference! You could definitely build your own smaller shed. I would just first make sure adding the shed in between isn’t going to shade out your plant beds too much, considering that you have fence to the left and the rear, and a deck to the right. You could always figure out the approximate size you want to build it, then prop up some plywood for a day and monitor the sunlight throughout the day. It’s always better to make sure things will work first before putting all that time, energy, and money into something that is just going to make it more difficult for your garden to grow. I think you’re right! I’m thinking about putting it in another corner of the yard now. Further away from my plants but that’s okay.